I finally finished the the ALBION COAT from the excellent Sari at https://www.colettepatterns.com/‎!!!! I Love her patterns! The pattern lent itself well to the changes I made. 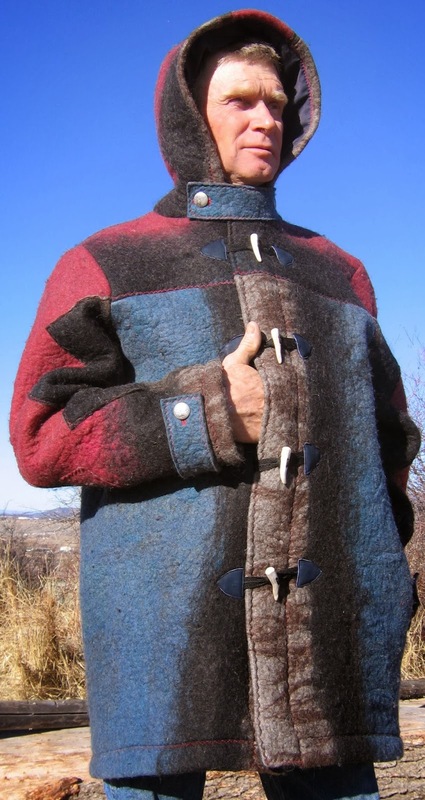 I used a handmade wool felt which is thicker than a wool coating that you can buy. The pattern had two sections for the sleeves which gave me the idea to cut them into a zigzag design. The pattern also requires topstitching (which I LOVE the look of) and gave me the idea to sew the sleeves together by laying one section on top and then topstitching. this I learned in making Sari's Ceylon Dress https://www.colettepatterns.com/‎. 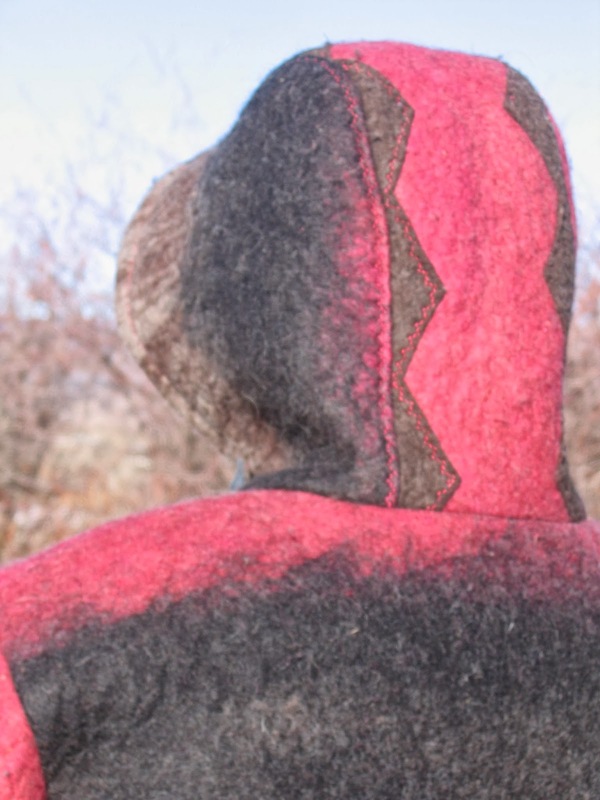 I created the hood in the same way- cutting the middle section into three zigzags. 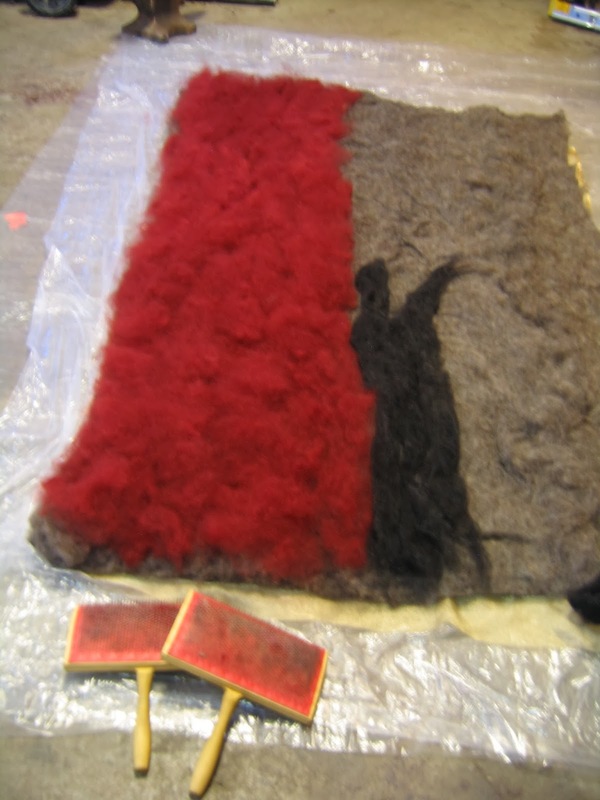 My handmade wool felt is wonderful to make coats out of because it will be warm and breathe so it is not stuffy. This particular felt was one piece! The colors are so beautiful in how they blend one into the other it was a trick to cut it out and put it together in a way that worked well for the coat. I almost did not have enough and there was NO way to get more of the same. I did make a muslin and a wearable muslin before cutting in order to be sure of the size and the layout on the felt. (My Camera broke while I was taking these pictures so I do not have photos of the wearable muslin right now). 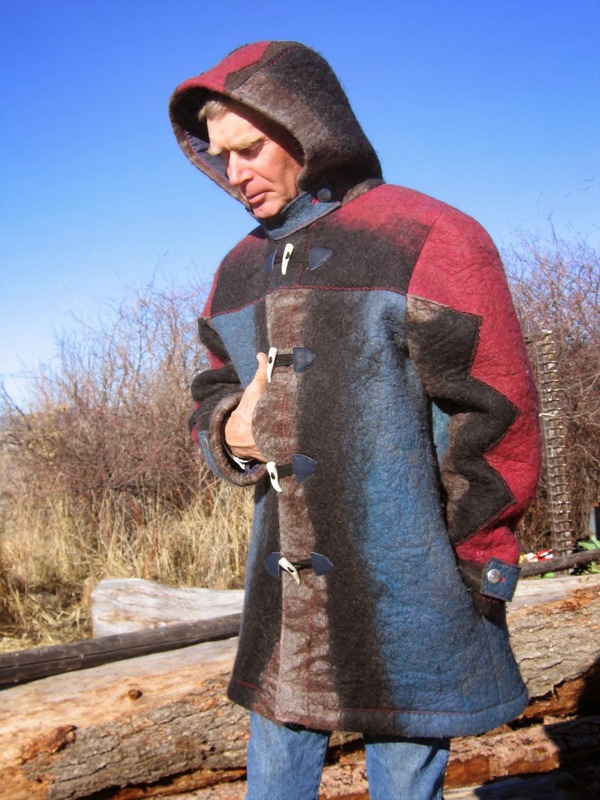 This coat is made for my husband and thus needed to accommodate him in his work. He is a woodcutter, tree trimmer, hunter, horse lover, and drives a team of horses logging and gives sleigh rides. This winter he had an accident with one of our BELOVED magic horses and we had to put the horse down. We were both grief filled. 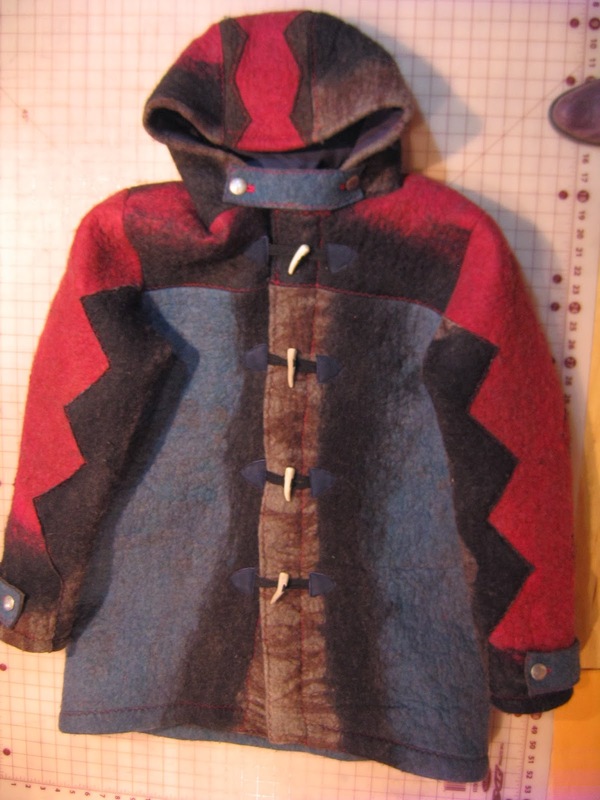 A very important teacher taught me to make a coat and turn grief into beauty. That is what I have attempted to do here. 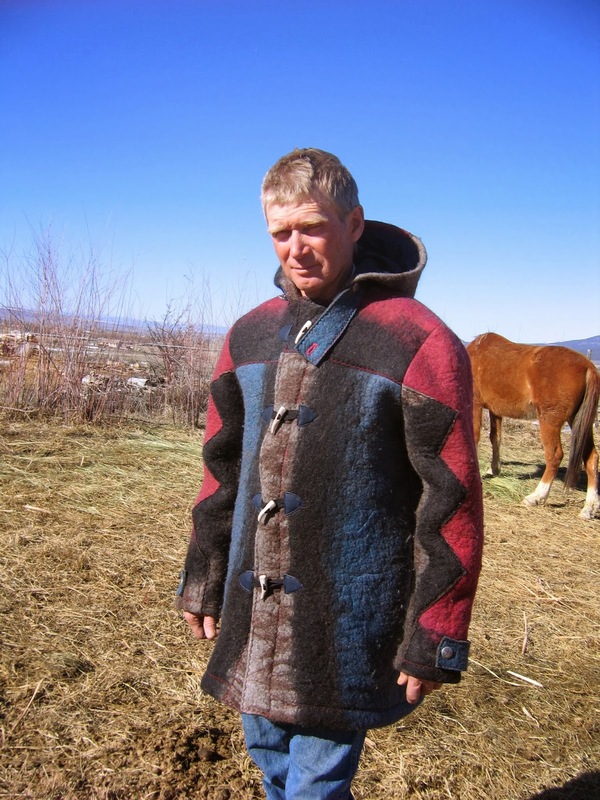 This coat is in memory of our magnificent star dappled grey-blue magic horse. He worked, hunted, and pulled the sleigh for my husband for years. It never hurts to have a little help from the doves. No, I do not have an embroidery sewing machine! I use a very simple, old 6019 Janome. I use a walking foot and move the felt under it- a quilting method I learned from Ellen Eddy's book called Thread Magic Garden at http://www.ellenanneeddy.com/. The felt is good to use for this because it does not gather/ pucker while embroidering as a lighter weight fabric would. This embroidered part of the coat took many many many LONG hours! Doing the drawing, copying, tracing, and transferring to the felt also takes a lot longer than you would think. This is the first time I have used toggles. It was fun to learn how to make them on the Albion sew-along at https://www.colettepatterns.com/‎. My husband made the toggles out of elk antler from elk he has hunted. They have antler texture, beautiful shapes and subtle color. I made leather tabs for the ends of the cording. I used some buttons for the hood closure tab and the sleeve tabs. I found these years ago and knew I wanted to use them on a coat for my husband because he is such a horse man. I added a cord for hanging the coat because I hate when my coats don't have them and slide off the coat hanger. 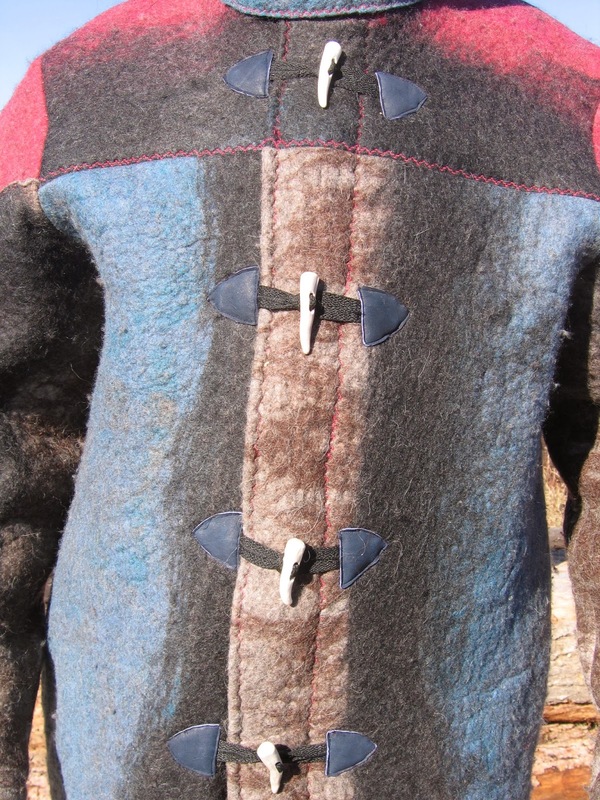 I lined the coat with a wool suiting in the body of the coat. It feels soft, breaths, and does not make noise as most synthetic linings do. My husband cannot have anything that makes the slightest noise when he is hunting. I only used a slippery textured synthetic for the sleeves so that other clothing does not get stuck as you pull on your coat. I made two internal breast patch pockets in the lining that button. A request for his wallet. Another cool thing about felt is that it does not unravel so I could trim all seam allowances and they are finished! Making felt can take a few days. It is good to start with wool batting that is especially for felting. Carting all that wool would take WAY long. Also you need to make sure it is wool batting for felting not for quilt making. Quilt making felt has been chemically stripped of the natural properties in wool that allow it to felt. Because natural dyed wool is more expensive you can lay the colored wool over the batting and end up with a layer of color that can bleed over into the other colors. This can be seen clearly in this coat. Then you put hot water, soap, roll it up, tie it and work it HARD back and forth until your arms are hurting and you wish you were done a long time ago. 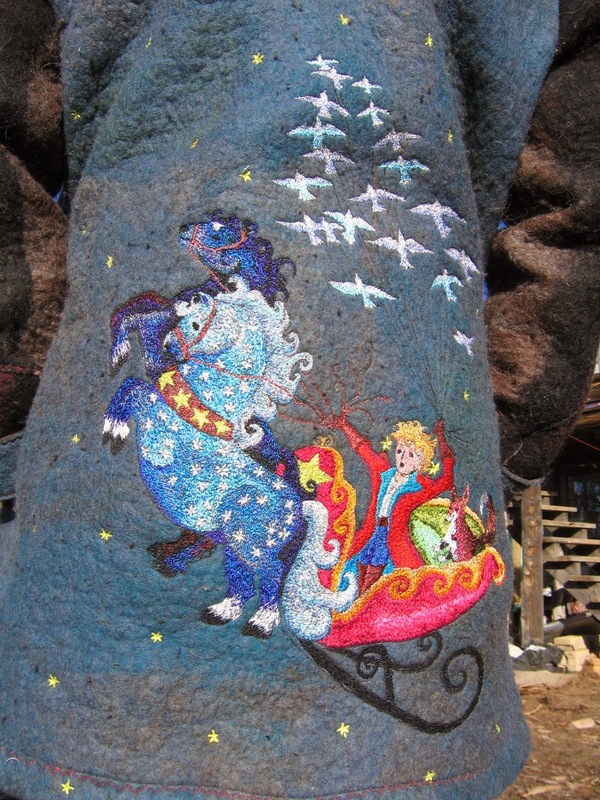 In memory of our Beloved magic horse who carried the stars on his coat from his nightly gallops through the sky. I love your version of this coat! wow! 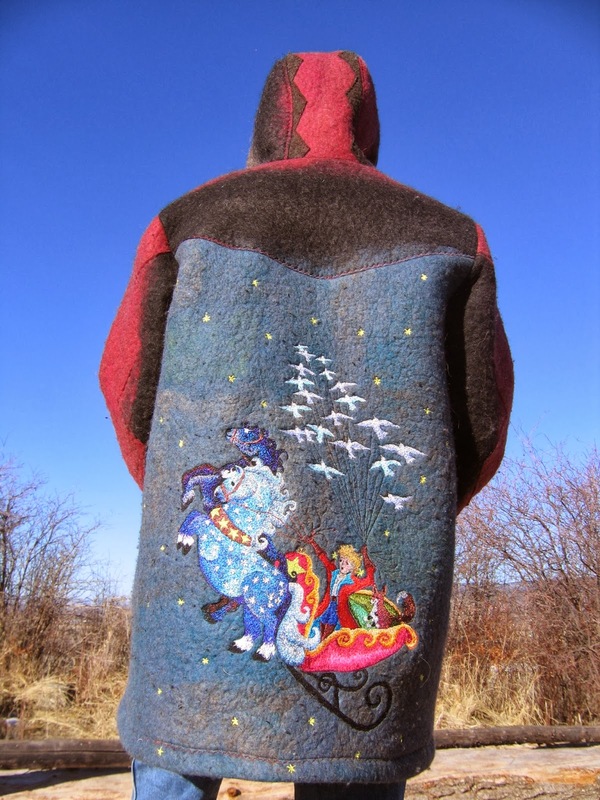 the handmade felt is beautiful, but the way you where able to do pattern placement is exquisite :) love the beauty and creatitivty you bring to this craft!! Thank you, THANK YOU so much for all your support and encouragement! I really couldn't have done it without your faith and help over these last 2 years! 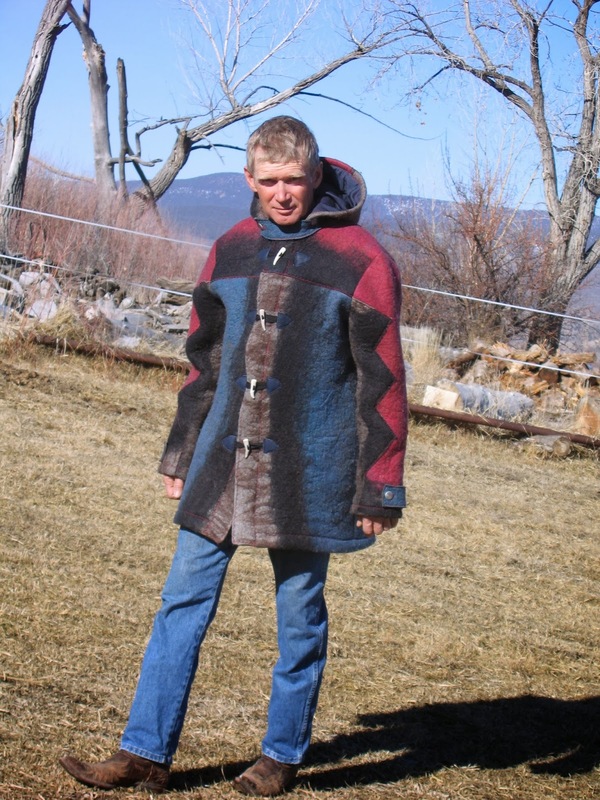 The amount of work that went into this coat is staggering! You've made something truly wonderful. Thank you! Yes, it took me along time but really it's only the third coat I have ever made and the first two I didn't use a pattern and just made things up when I didn't know what to do. Thanks for looking in on this blog! I have never seen anything like this before. 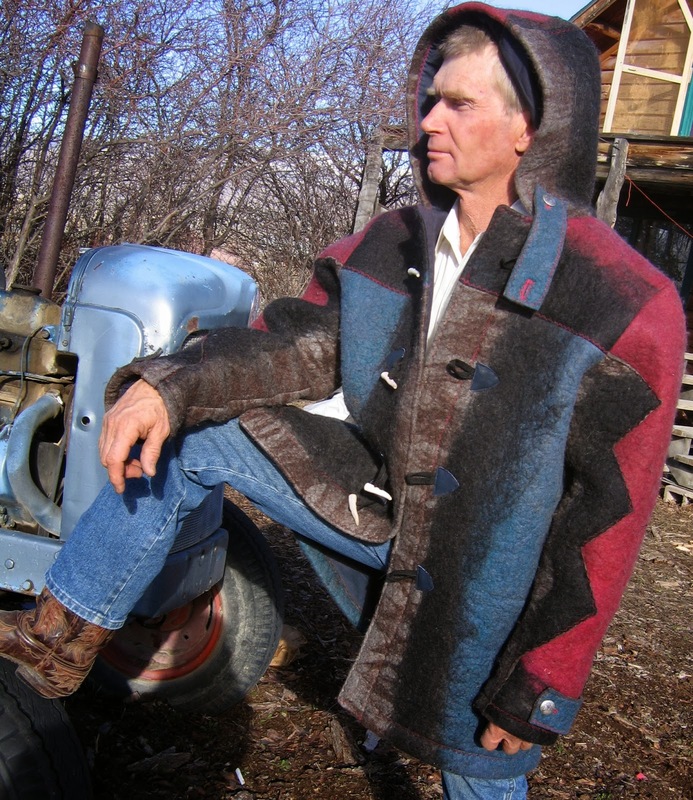 I have made many felt coats myself, and nothing compares to this level of dedication, precision, and artistry. Rocky is smiling from the stars! You are a true phenom Dante! Absolutely stunning! What a labor of love. I am so taken with the level of artistry. workmanship and time that went into the coat. Winning aside, you should be so, SO pleased with yourself. Job well done. Thank you so much for your kind comments! Yes!!! I am in LOVE with this art of sewing right now in my life!!!!!! !